The all-new C-Class heralds a new chapter in the Mercedes-Benz success story and sets new standards in the premium mid‑range class. Thanks to an intelligent lightweight design concept boasting weight savings of up to 100 kilograms, excellent aerodynamics and new, economical engines, the C-Class establishes new benchmarks in its class. A host of new assistance systems offer safety of the highest standard, while a new suspension, optionally air-sprung, provides for exemplary ride and driving comfort as well as nimble and agile handling. In terms of appearance the new C-Class adopts a progressive approach with its clear yet emotional design and its high-class interior. Many other innovations and interior touches underscore the saloon's energising comfort and refined sportiness. In all, the perceived quality of the new C‑Class feels like an “upgrade to a higher class of travel”. The new C-Class Saloon is available for ordering now. The model range will initially comprise the C 180 from 33,558.- euros, the C 200 from 36,414.- euros and the C 220 BlueTEC from 38,675.- euros, (prices in Germany incl. 19% VAT in each case). The C-Class is the biggest-selling model series from Mercedes-Benz. Sales of the preceding model, which was launched in 2007, total over 2.4 million. The new C-Class offers sensual and clear design and a host of technical innovations as well as a comprehensive scope of standard equipment and exemplary emission and fuel consumption values. This all adds up to substantial added value and long-term savings on motor vehicle tax and at the filling station. "Mercedes at its best - that's the new C-Class, which sets new standards for the mid-range segment on many fronts," says Prof. Dr Thomas Weber, Member of the Board of Management of Daimler AG responsible for Group Research and Mercedes-Benz Cars Development. "It is characterised by an emotional yet clear design which is continued in the high-quality and modern interior. Its efficient and high-performance engineering provides the basis for a high standard of driving enjoyment." Ola Källenius, Executive Vice President, Sales and Marketing Mercedes-Benz Cars, adds: "The new C-Class embodies Mercedes-Benz's claim "The best or nothing" in uncompromising style. This is immediately apparent when encountering our new saloon for the first time, as it creates the impression that one is sitting in a higher class of automobile. I am sure that our customers will be delighted by the high-class appeal and agility of the new C-Class." The C-Class has grown to take account of people's increasing average height. With an 80-millimetre increase in the wheelbase (2840 millimetres) compared with the previous model, the vehicle is 95 millimetres longer (4686 millimetres) and 40 millimetres wider (1810 millimetres). The resultant additional space benefits first and foremost the rear passengers, who now travel in even greater comfort. 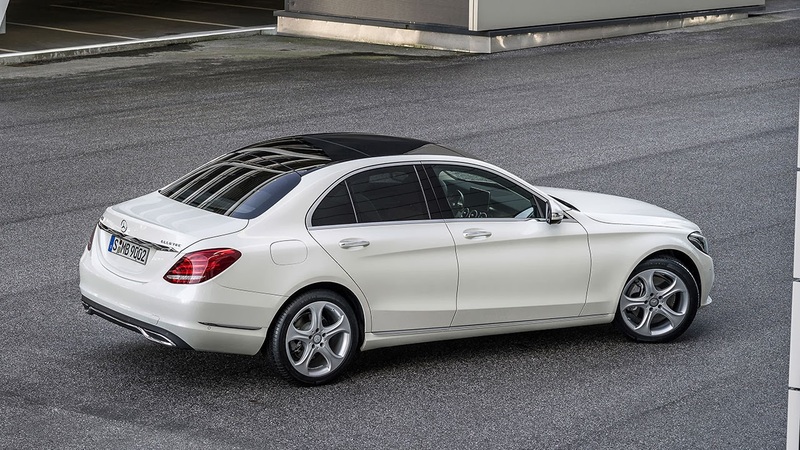 The new C-Class also outstrips its predecessor in terms of boot capacity, at 480 litres (in accordance with ISO 3832). 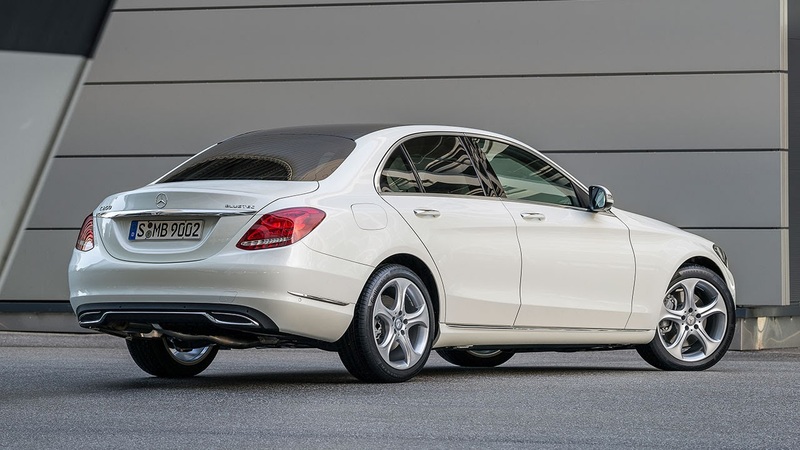 On a visual level, the new C-Class represents a bold departure from its predecessor. Its striking, dynamic design exudes sensual purity and arouses emotions. Modern aesthetic was a source of inspiration for the new saloon's sensuous lines and surfaces, whose harmony and dynamism create an immediate effect. The designers have created minimalist, purist forms for the C-Class which emphasise its intelligent technology and engineering. The clearly defined surfaces deliberately display a degree of tension, lending them a modern and emotional character. Precise lines and sculptural surfaces create progressive light and shade effects. As Gorden Wagener, Vice President Design Daimler AG, notes: "The new C-Class showcases automotive passion by way of a contemporary design idiom. Progressive and emotional highlights underscore the ground-breaking design style of the new C-Class and demonstrate sensual purity. The new C-Class interprets modern luxury on a new level. In the side view a long bonnet, a passenger compartment set well back and short overhangs define the C-Class's classic, well-balanced Mercedes-Benz saloon proportions. Large wheels emphasize the rear and communicate a stylishly sporty character. 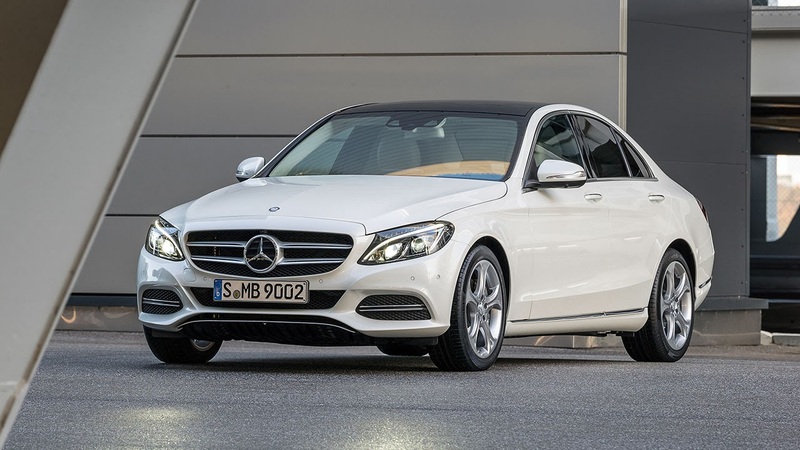 There is a choice of two different faces: sporty with centrally positioned star or – for the EXCLUSIVE line only – the classic saloon radiator grille featuring the Mercedes star on the bonnet. The fins of the radiator grille can be closed completely to optimise the vehicle's Cd value, highlighting the status of this cultivated saloon in duly self-assured style. 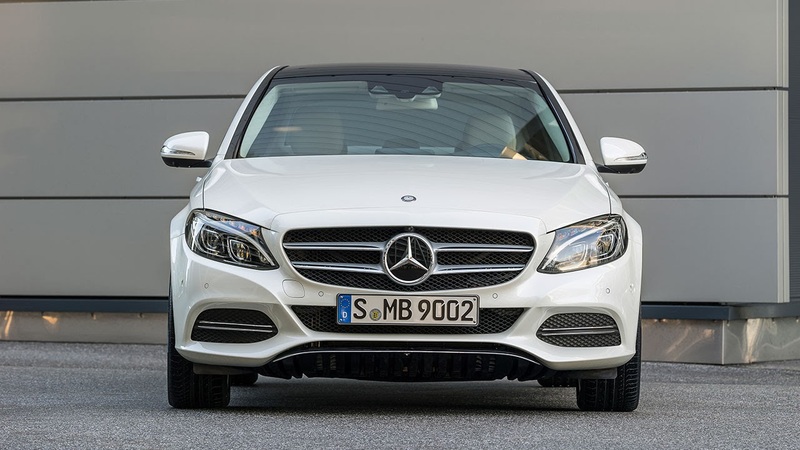 The new C-Class comes with H7 halogen headlamps as standard. In addition to the standard-fit headlamps, two energy-saving LED variants are available: a static system and a dynamic version with "LED Intelligent Light System". The characteristic night design lends the new C-Class its very own distinctive look in the dark, too. The rear lamp and brake light in the tail lights feature LED technology in all headlamp versions. The Mercedes-Benz designers have styled the interior on a level which is rarely encountered even in higher vehicle categories. This applies to the carefully chosen high-class materials and their pleasant touch and feel as well as the precision of the finely crafted details. The interior also embodies a new design idiom which combines sensuousness and purity perfectly with dynamic sportiness and contributes to the quality feel of the interior. The interior design demonstrates a bold new approach by Mercedes-Benz. Here the designers combine in accomplished style the architecture of Mercedes-Benz sports cars with a totally new centre console featuring flowing lines. In automatic vehicles a large one-piece centre console panel performs an elegant sweep from the centre air vents to the armrest. These seamless clear-cut lines create a sense of open space and convey a thrillingly purist and modern feel. A centrally positioned free-standing central display is the main eye-catching feature across the centre console – with a screen diagonal of 17.78 centimetres (7 inches), or 21.33 centimetres (8.4 inches) if COMAND Online is specified. Five round air vents lend the dashboard a sporty touch. With their metallic cool-touch effect they create a fascinating, tangible contrast to the warm look of the other materials – such as the wood in the centre console or the leather on the dashboard. The "upgrade" feel duly continues with the controls. All switches feature a high-quality, three-dimensional design befitting a luxury vehicle and benefit from a clear layout. The innovative touchpad in the handrest over the Controller on the centre tunnel marks a further evolutionary step developed in-house at Mercedes-Benz. As on a smartphone, this provides for very simple and intuitive operation of all the head-unit functions using finger gestures. The touchpad also permits letters, numbers and special characters to be entered in handwriting – in any language. The user receives clear haptic feedback when operating the touchpad's control surface, which is highly conducive to genuine intuitive use. A head-up display is also new to the C-Class. Like in a jet fighter, it displays important information directly in the driver's field of vision on the front windscreen, thus providing for clear legibility and ensuring that the driver is distracted less from the road ahead. The system provides information on vehicle speed, speed limits and navigation instructions and displays messages from DISTRONIC PLUS. Three different design and equipment lines for the exterior and interior respectively offer further scope for individualisation in addition to the standard equipment and appointments. The AVANTGARDE line showcases the C-Class as a sporty saloon, the EXCLUSIVE line places the emphasis on sophistication and modern luxury and the AMG line lends the C-Class a decidedly sporty character. The body-in-white of the new C-Class provides an innovative basis for reduced weight, outstanding rigidity, including introduction rigidity for excellent handling, combined with optimum noise and vibration characteristics and a high level of crash safety. Thanks to intelligent and innovative lightweight construction, the aluminium hybrid body is around 70 kg lighter than a conventional steel body. The vehicle's overall weight is even reduced by around 100 kilograms. As such, the new C-Class leads the "lightweight rankings" in its segment. This spawns numerous benefits: the lightweight construction of the new C-Class cuts fuel consumption by up to 20 percent without any loss of performance, while at the same time enabling a lower centre of gravity, which in turn gives rise to the vehicle's noticeably sporty and agile handling. Mercedes-Benz achieves this feat of lightweight construction by various measures, including a completely new structural design and the use of an unusually high proportion of aluminium for a mass-produced range. The share of aluminium has risen compared with the successful predecessor from under 10 percent to almost 50 percent. In keeping with Mercedes-Benz traditions, the body is designed for exemplary crash safety. 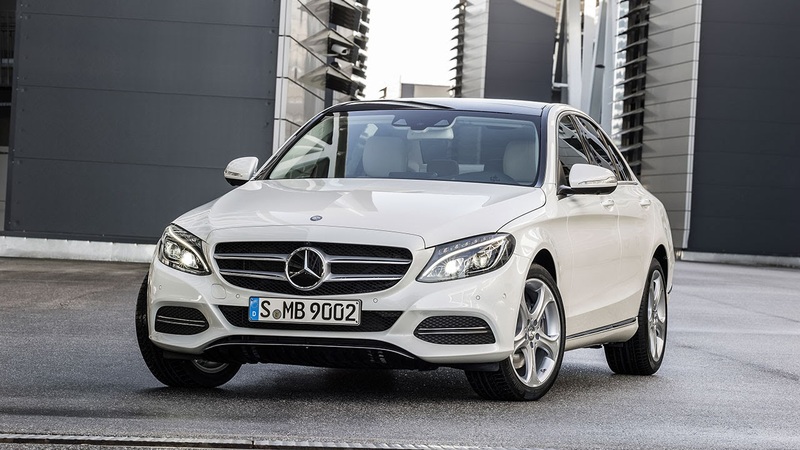 As a result, the saloon complies not only with all current national laws but also with all rating requirements, as well as meeting the more stringent internal Mercedes-Benz safety standards based on what actually happens during accidents. A high-strength safety passenger compartment forms the core of this concept. It is surrounded by specifically configured and field-tested deformation zones which ensure maximum safety for the occupants by virtue of optimised force paths and a combination of aluminium castings and ultra-high-strength materials. An outer skin consisting almost completely of aluminium provides a protective shell for the body. Low drag is crucial to achieving outstanding efficiency. From a speed of just under 70 km/h, aerodynamic drag exceeds the sum total of all other driving resistance factors. As such, drag constitutes a major parameter in efforts to reduce fuel consumption and CO2 emissions. 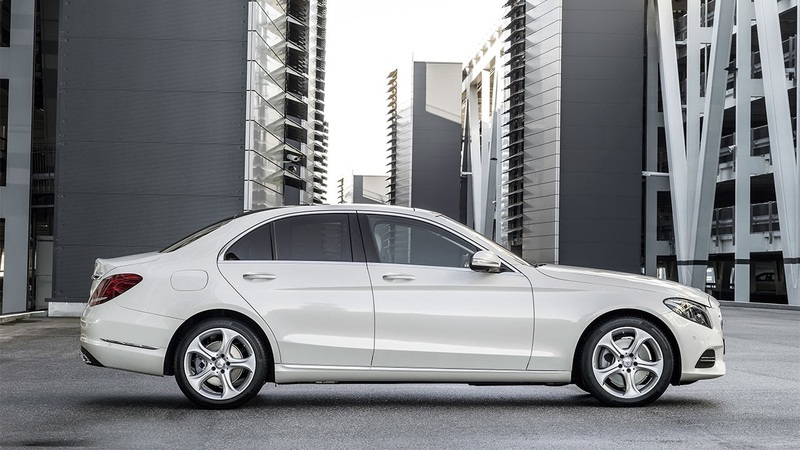 With a Cd value of 0.24 for the C 220 BlueTEC ECO, the new C-Class Saloon sets a new benchmark in the mid-range segment. The wind noise level, which was already very low in the preceding generation of the C-Class, has been lowered still further. The engineers have also devoted painstaking attention to optimising other potential sources of disturbance which may have an adverse effect on the driver's and passengers' wellbeing and concentration, even though they may not consciously notice the effects. NVH (noise, vibration, harshness) is the technical term for such nuisance factors. The specialists have optimised the noise characteristics of the interior blower, the power windows, the seat adjustment functions and many other actuation and operating noises, for example. 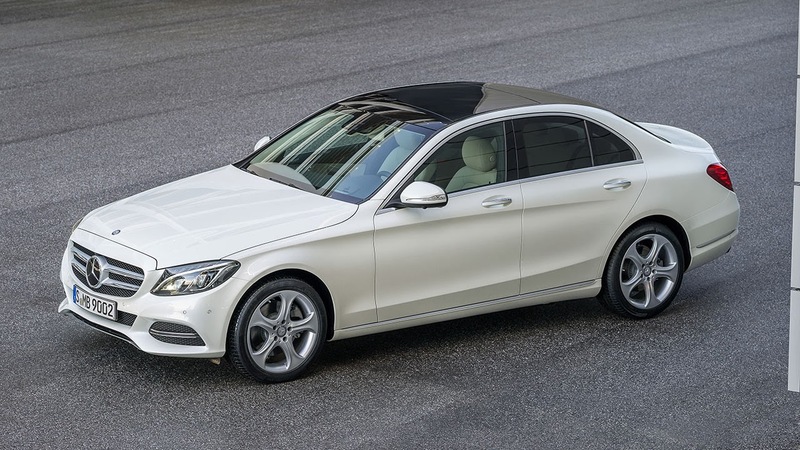 As a result, the new C-Class occupies a benchmark position in its segment.